Hidden gluten allergies can cause misery in women's lives until the underlying cause of their symptoms is found and treated accordingly. Continue reading to discover much-needed answers to common gluten allergy questions, and get back on track to living an improved quality of life today. Gluten is the general name for proteins found in wheat, rye, barley, and their hybrids, such as triticale, a cross between wheat and rye. The function of gluten is to help foods maintain their shape. Gluten is found in a variety of everyday foods. For example, foods with wheat include salad dressings, pasta, soups, various baked goods, breads, cereals, and sauces. Barley is commonly found in beer, food coloring, malt, brewer's yeast, and soups, too. Also, rye is popular in cereals as well as rye bread and beer. What are types of gluten-related allergies? Gluten-related allergies include celiac disease, dermatitis herpetiformis, and gluten sensitivities. Celiac disease and dermatitis herpetiformis. These autoimmune gluten disorders are genetic. Autoimmune gluten disorders are triggered to become active and then do not disappear. They cause damage to intestinal tissue or the skin when consuming gluten. Gluten sensitivity. This is categorized as an innate immune responses and is also known as non-celiac gluten sensitivity. Gluten sensitivities do not cause damage to the intestines or skin. Although, they may cause inflammation and other health problems. Does menopause affect gluten allergies? Yes, menopause affects allergies, causing aggravation of all allergy symptoms or fostering the evolution of newfound allergies. Accordingly, women may suffer from gluten-related allergies due to the hormonal imbalance. These gluten allergies are considered gluten sensitivities instead of autoimmune gluten disorders since they are not genetic. What are symptoms of a gluten allergy? Autoimmune gluten disorders as well as innate immune responses cause symptoms that affect all body systems. They evoke more common symptoms of gastrointestinal woes, such as diarrhea, bloating, abdominal pain, constipation, and cramping. They can also cause ADHD-like behavior, depression, and difficulty concentrating. More severe symptoms of a gluten allergy include leg numbness, osteoporosis, anemia, and joint pain if not managed accordingly. Can I test for a gluten allergy? Yes, you can test for a gluten allergy if you have celiac disease. With celiac disease, the gluten allergy is genetic, and a simple blood test of certain antibodies can confirm the autoimmune disorder. Keep in mind that you must be on a gluten-containing diet for the blood testing to measure accurately. You can also test for celiac disease with an intestinal biopsy and through genetic testing. If you have a gluten sensitivity, you will be recommended to try a gluten elimination diet since there are no recommended tests available to confirm the gluten allergy. This diet consists of removing all gluten from your diet for a specified period of time and then reintroducing it. If symptoms disappear and then return after reintroduction, you will be diagnosed with having a gluten sensitivity. If not, other allergy tests may be pursued. How do I prevent gluten allergies? Consume a gluten-free diet to eliminate symptoms evoked by gluten allergies. Treatment for all gluten allergies - celiac disease, dermatitis herpetiformis, and gluten intolerance - is approached the same way due to the fact that there are no supplements or medications on the market to “lessen” the effects of gluten ingestion. Choosing to eliminate gluten from your diet is the best way to treat gluten allergies. Be sure to only consume food products that are innately gluten-free, and carefully analyze food product labels before purchase. Some anti-allergy medications, such as the antihistamine diphenhydramine as well as epinephrine, may also reduce minor symptoms of gluten allergies and control allergic reactions. In the case of menopausal women, the best treatment method is to encourage hormonal balance by pursuing allergy treatment options involving lifestyle changes, hormone-regulating supplementation, and more. All in all, gluten - proteins found in wheat, rye, barley, and their hybrids - can cause a variety of gastrointestinal symptoms and more for those with gluten allergies. 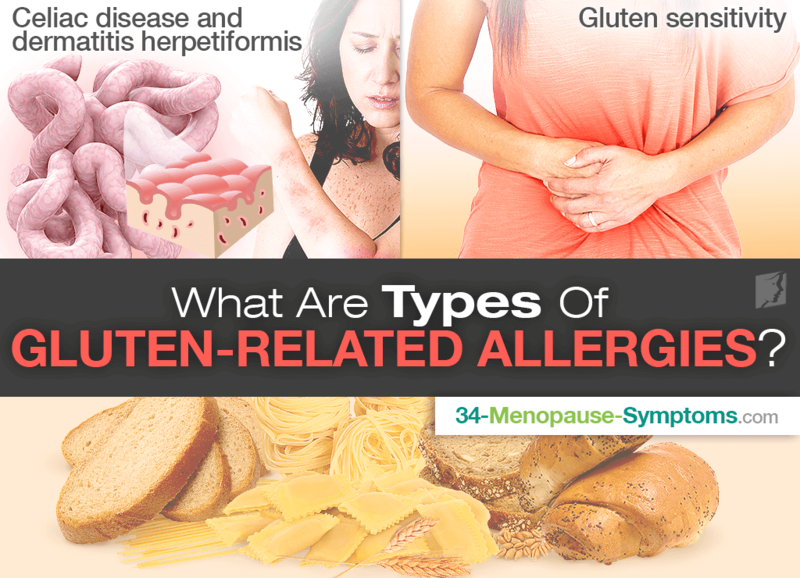 Gluten allergies are recognized as those that are autoimmune, such as celiac disease and dermatitis herpetiformis, and an innate immune response, like non-celiac gluten sensitivity. Testing varies between the allergies, and treatment options involve permanently removing gluten from your diet and working toward hormonal balance, which may be causing symptoms.